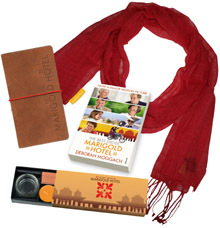 Win 'The Best Exotic Marigold Hotel' goodies! Win ‘The Best Exotic Marigold Hotel’ goodies! Posted February 22, 2012 by William Martin & filed under Win. To celebrate the release of The Best Exotic Marigold Hotel in cinemas on 24th February, we’ve got goody bags (including a pashmina, scented candle, travel journal and wallet and a copy of Deborah Moggach’s original book) to give away to five of our Twitter followers! > Watch the latest movie trailers. For a disparate group of English pensioners (Judi Dench, Bill Nighy, Maggie Smith, Tom Wilkinson, Penelope Wilton, Celia Imrie and Ronald Pickup), retirement takes an unconventional turn when they abandon their homeland, enticed by advertisements for The Best Exotic Marigold Hotel, a seemingly luxurious sanctuary for “the elderly and beautiful” in Jaipur, India. On arrival, they discover that the hotel falls somewhat short of the romantic idyll promised in the brochure, but they are gradually won over by the ever-optimistic young manager Sonny (Dev Patel), and tentatively embark on a new adventure, finding that life can begin again when you let go of the past. This competition has now closed. The winners are Sian Walters (@CaptainsCariad) from London, Olivia Kirby (@olivia280177) from Melton Mowbray, Sarah Steeples (@Saspidistra) from Norwich, Jamie Harrison (@jamiehg07) from Middlesbrough and Mark Blackburn (@Blackburn742) from Woodbridge.